I was musing about that recently as I found myself using what GIS software does while trying to explain to someone what I mean by "geographic reasoning." As I've written before in this space, one of my biggest challenges as an advocate for improved geography education is explaining what geography is really about. Since most people tend to associate geography with factual knowledge, I want to be able to broaden their understanding of geography by explaining geographic reasoning to them. However, I've struggled to find descriptions of geographic reasoning that are helpful when talking to people who haven't studied geography. What I've found are two kinds of descriptions of geographic reasoning. One characterizes geographic reasoning using terms and examples that only other geographers can understand. 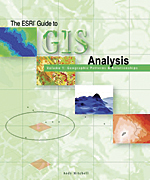 The other is frustratingly circular: geographic reasoning is what geographers do to understand the world; geographic reasoning consists of asking geographic questions, gathering and analyzing geographic information, and constructing geographic explanations; geographic reasoning is the process of constructing explanations and predictions about place and location. There is no shortage of examples of geographic reasoning. John Snow's discovery of the source of the 1854 cholera outbreak in London immediately comes to mind. However, it's hard to see what the underlying reasoning is in individual examples. This list happens to be the main chapters in the second volume of Mitchell's series, but to me it reads like a clear list of the core components of geographic reasoning. I assume that Mitchell did not sit down to identify the conceptual categories of geographic reasoning. 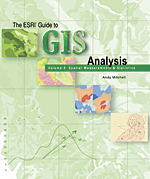 Presumably, he set out to create a well-organized overview of what you can do with sophisticated GIS software. However, the outcome here is the same as the one that many researchers in artificial intelligence seek. It will come as no surprise that I lifted the first list from the table of contents of volume 1 and the second from volume 3 of Mitchell's series. So the next time someone asks me what's valuable about geography education, I won't turn to John Snow and the 19th century. I will tell them about identifying patterns and clusters or modeling paths and flow.